Royal Elite Canadian Hutterite Goose Down duvet encased in 400 thread count, 100% down-proof cotton. You'll enjoy this lightweight duvet with exceptional insulating properties. Made in Canada. Our products contain the Downmark label which is your assurance of quality and contents. Available in 3 weights and 4 sizes. Available in Summer, Four Seasons and Winter weight. Sizes and weights: Summer Weight: 66" x 90" - 18 oz, Double - 80 x 90" - 22 oz, Queen - 90 x 92" - 25 oz, King - 105 x 92" - 29 oz. Four Seasons Weight: Twin - 66 x 90" - 22 oz, Double - 80 x 90" - 27oz, Queen - 90 x 92" - 30 oz, King - 105 x 92" - 35 oz. Winter Weight: Twin - 66 x 90" - 26 oz, Double - 80 x 90" - 32 oz, Queen - 90 x 92" - 35 oz, King - 105 x 92" - 41 oz. It is filled with 850-fill power Hutterite white Goose down for ultimate loft and recovery. 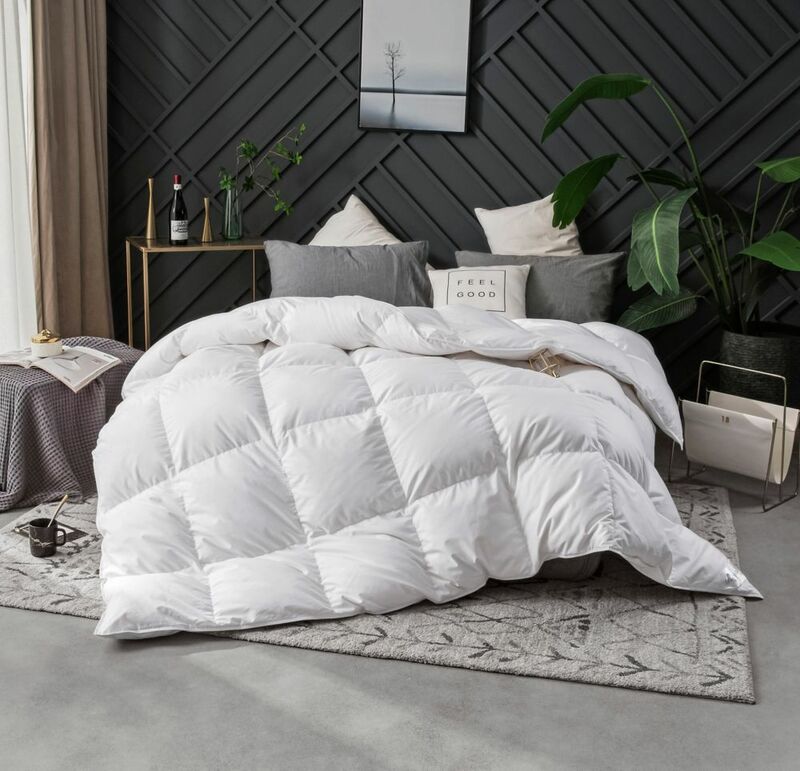 400T Hutterite Goose Down Duvet, Summer, Double22 Royal Elite Canadian Hutterite Goose Down duvet encased in 400 thread count, 100% down-proof cotton. You'll enjoy this lightweight duvet with exceptional insulating properties. Made in Canada. Our products contain the Downmark label which is your assurance of quality and contents. Available in 3 weights and 4 sizes. Available in Summer, Four Seasons and Winter weight. Sizes and weights: Summer Weight: 66" x 90" - 18 oz, Double - 80 x 90" - 22 oz, Queen - 90 x 92" - 25 oz, King - 105 x 92" - 29 oz. Four Seasons Weight: Twin - 66 x 90" - 22 oz, Double - 80 x 90" - 27oz, Queen - 90 x 92" - 30 oz, King - 105 x 92" - 35 oz. Winter Weight: Twin - 66 x 90" - 26 oz, Double - 80 x 90" - 32 oz, Queen - 90 x 92" - 35 oz, King - 105 x 92" - 41 oz.